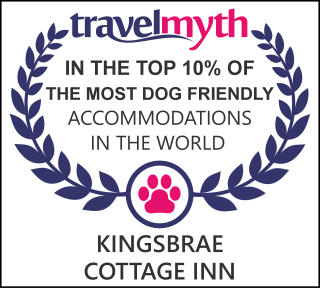 Kingsbrae Arms is a kid, family, and dog friendly destination. You really don’t plan to leave them behind, do you? Our Carriage House Suite and garden level Patio Stables are especially suited to welcome multi-generational gatherings of grandparents, parents, kids, and dogs. With direct access to the inn’s private garden, kids can play safely. Dogs can’t get out…and vice versa. Some of our other guest rooms are also designated pet friendly. as long as owners are well behaved. Let us know you plan to bring along your dog. Keep dogs on leash when other guests are around. We have all heard the line “my dog does not bark”… fine if it’s true, but a problem if the only time the little guy barks is when you’re away. We will insist that you remain with your pet at all times if there are any mishaps that disturb other guests. And finally, we will ask that you be responsible for any damage or injury caused by your dog, and that all “business” be “scooped and discarded”.